This 31 page book has five parts to it. The first part is seconds. The second part is thirds, major scales and chords. Part three is fifths, octaves, key signatures, and circle of fifths. Part four is interval training and drills and Part five is twenty sight-reading examples taken from classical, folk and show repertoire. In addition, each chapter incorporates rhythmic exercises, dictation, repetition, theory, writing, singing and listening. 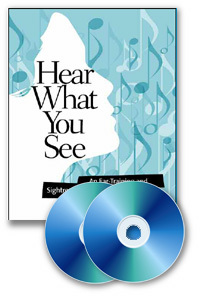 Two CDs are included in this program. They are a very important part of the program. Every concept and sight-reading example is demonstrated (both played and sung). Your ear will be greatly strengthened by doing the exercises in this program and your theoretical knowledge of music will grow immensely!